Well, we promised we’d be back with updates on the developing story of declining honeybees and Colony Collapse Disorder (CCD)—the rapid and unexplained loss of worker bees from a colony—and here we are. The story has been gaining more traction in the news, possibly because farmers and grocers are starting to feel the sting of grappling with lower yields and setting higher food prices. But, a new article entitled “Death by pest or pesticide? Antibiotic dangers trap bees in a Catch 22” by Matthew Thompson of The Ecologist has presented a dimension of the problem that I have yet to see reported. After speaking to various beekeepers and several experts on the subject from Penn State University and the Florida Department of Agriculture, we knew very well that pesticides played at least one vital role in the multi-pronged issue of CCD. We knew that the chemicals contained in systemic pesticides (a combination of pesticides and fungicides) had unforeseen synergistic effects on bee larvae and bee immune systems. However, Thompson cites a new study from the University of Maryland into the effects of antibiotics. The report, Killing Them with Kindness? In-Hive Medications May Inhibit Xenobiotic Efflux Transporters and Endanger Honey Bees explore the use of antibiotics widely used in the bee industry, such as oxytetracycline, and suggest that they’re preventing bees from effectively excreting widely used pesticides thus the “Catch 22” in Thompson’s title. So, if we stopped feeding the honeybees pesticides, we expose them to pests like tracheal mites and the Varroa destructor mite. If we stop feeding them antibiotics, we expose them to a whole other range of pathogens and bacteria like American foulbrood (ironically present in Australia at the moment). So, we must continue using both, and we know that the antibiotic-induced inability to void common pesticides led to death rates of up to 51 percent in the study. 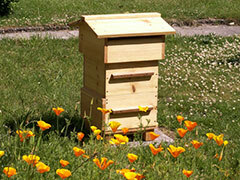 What is a beekeeper to do? Any ideas out there? How can we protect the bees from all these threats without the use of chemicals? Posted on February 3rd under Global Ecology.